Downloads: PDF, mp3, and other options. ONE time when Dorothy Ann’s mother and father went out to spend the evening, Dorothy Ann sat up late reading about the knights of King Arthur’s Round Table. It was long after eight o’clock when she finished her chapter, at the end of which she had promised her mother she would go to bed. Dorothy Ann thought of all her most adventurous friends, the Swan, the Polar Bear, the Rooster, the Fisher Boy, but none of them wore armor. The more she thought about him, the more cerain she was that he was the one Armored Adventurer in this city and the more she longed to discover how often he started out on his quests and where he went. You may have noticed that it never takes Dorothy Ann long to do a thing after she has made up her mind, so that in a few minutes she was on her way over the hill toward Main Street. The blocks seemed much shorter at night than in the daytime, and she was surprised to find how quickly she reached the common. 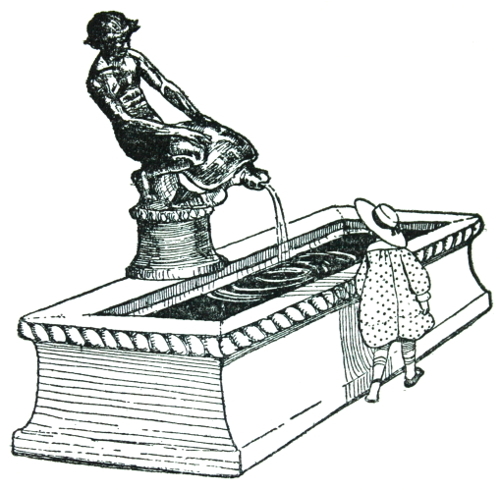 As she crossed it towards Salem Square, she saw that there was a struggle taking place on the watering trough between the Boy and the Turtle. The Turtle seemed to be trying to get away and the Boy to prevent his doing so. “Oh, no he won’t,” laughed the Boy mischievously. “When he is big enough I get on his back and go with him. I wouldn’t trust him to come back in the morning, if he went alone. There will be room for you, too, if you would like to go along tonight. Here, crawl up on top the armor,” he added, holding out his hand to her without waiting for any answer further than her dancing eyes. In a minute she felt the Turtle move forward. She turned around in terror, thinking she was being carried off alone. But the Boy was taking a running jump and landed on the back of the Turtle just the way the boys who “push off” get on the end of double-runners in the winter when you think they will surely be left behind. Down the street ran the Turtle, which had now grown quite enormous, all four legs going so fast you could hardly see them, his head bobbing up and down in front and his tail wagging from side to side in back. Dorothy Ann looked around, not understanding him, at which that wonderful laugh again filled the air. As he said this he began to call with sounds as strange and musical as was his laugh. They were now going through a country road and, as he called, the birds woke from their sleep and flew in great flocks to the edge of the woods, answering him with a chorus of song. The bunnies popped out of their burrows, the squirrels came scampering over the stone walls, even the blind moles crawled up from their dark underground houses. Dorothy Ann glanced back at the Boy. His eyes were sparkling as if reflecting the light of the fireflies, his body swayed back and forth in answer to the calls of his friends like the graceful tops of poplars in a breeze, and his whole being seemed to laugh with the joy of outdoors. “You are like Peter Pan,” whispered Dorothy Ann, softly, as if afraid her voice would be a strange sound in this new world she was in. They were now getting near the seashore. Dorothy Ann took in great deep breaths of the salt air. “You haven’t told me yet how you and the Turtle happened to go to Worcester,” she said. Just then Dorothy Ann looked up and saw they were almost at the ocean. Ahead of them was a high rock cliff, up which the Turtle moved faster when he saw the cool water so near. Nevertheless, Dorothy Ann caught her breath as the Turtle leaped off the cliff and went flying through the air. They struck the water with a splash and sank way down into the green regions below. 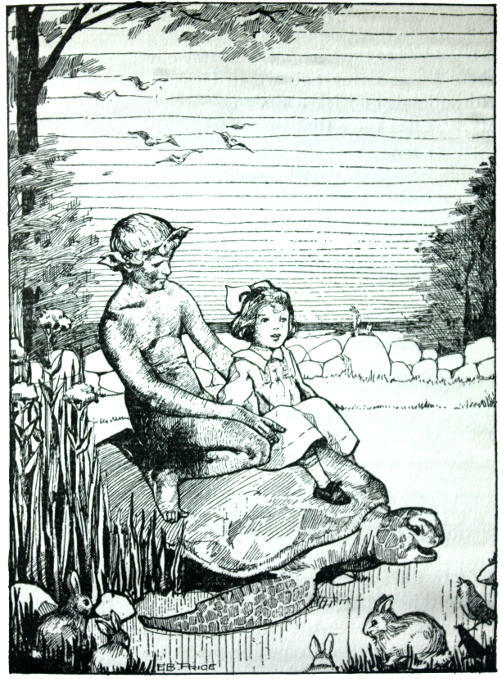 After a few seconds they came up again and the Turtle, with Dorothy Ann and the Boy still clinging to his armor, went swimming back to the shore. “There, wasn’t that fun!” cried the Boy, his wonderful laugh echoing from one rick cliff to the next. What Dorothy Ann said was exactly true. Over and over again they climbed the rocks and jumped off. Each time it was more fun to go whizzing through the air than it had been the time before. Any “shoot-the-chutes” ever made was tame in comparison to it. After the first shock Dorothy Ann liked to strike the clear, cold water. Sometimes they landed on top of a wave, which broke about them into foam. While the foam floated off in all directions like a fleet of fairy boats, the turtle and his two passengers sank into the dark water below. As Dorothy Ann’s eyes became accustomed to the queer heavy look underneath, she could discover more and more strange fish swimming about her. It was like a new world of never-ending wonders, peopled with star-fish, sea urchins, fairy-like shells and swimming things of marvelous lights and colors. She would have liked to linger a few minutes to explore this new realm, if she had not been in such a hurry to climb the rock again and have the fun of going splash into the water. She was sorry indeed when the Boy said it was time to go back to Salem Square. Hardly had she sat down on the lounge in her own room to think over her adventures when she heard the front door open and voices in the hall. And before she went to bed Dorothy Ann had to tell her mother all about her wonderful adventure.